The final instalment of Pete Walker’s Home Counties horror trilogy saw him round his mischievous eye on the Catholic Church, which for 1975, was no small fight to pick. 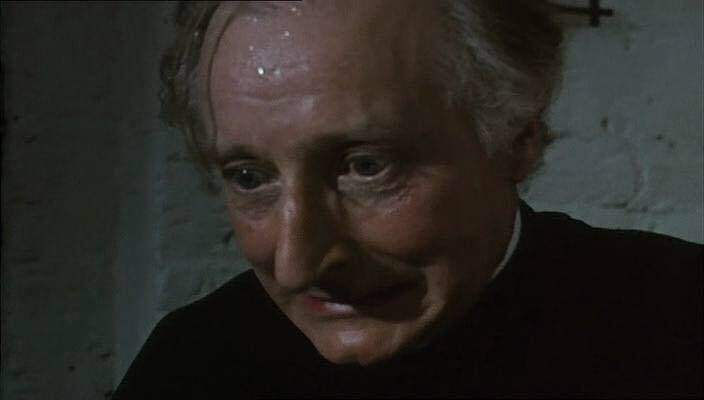 Despite filling his last two films with some truly grotesque and disturbing characters, House Of Mortal Sin might feature his most despicable villain yet, Father Xavier Meldrum. A creepy, insane serial killer with urges he can’t control and a range of Catholic paraphernalia that double as murder weapons. Jenny (Susan Penhaligon) is in the throes of a nasty break-up with her boyfriend Terry (Stewart Bevan) and is consoled by bumping into an old friend, Bernard (Norman Eshley), who’s now a priest in need of a new place to live. Invited to take the spare room in the flat Jenny shares with her sister, Vanessa (Stephanie Beacham), Bernard becomes a confidant to the former, while the latter awakens dormant romantic feelings in the supposedly now celibate priest. You can tell Walker is going out his way to be controversial here, but for all it’s nastiness, House Of Mortal Sin is a ridiculously fun film. Father Meldrum isn’t as disturbing as his usual lead horrors had been, being more of a leering, sinister presence, backed up by the almost Bond villain henchman that is Brabazon. They’re some pair and even though she doesn’t even leave the chapel house, Shiela Keith gives her usual imperious, utterly terrifying performance. Walker almost seems to acknowledge this with her intro, as she answers the door of the house, one-eyed and intense, with a suitably demonic piece of background music, as if to trigger a response in the audience of “Oh, god. It’s Shiela Keith”. She’s not got too much to do, but her 30 years of unrequited love for Father Meldrum would be heartbreaking if the pair weren’t so awful, while her devotion to him doesn’t extend to his frail mother, who clearly gets tortured by her as soon as he leaves the house. Grim. Meldrum himself is magnificent too. Obsessing over Jenny, he’s plagued by guilt about his feelings, but thinks absolutely nothing of brutally murdering anyone that takes his fancy with things like a burning incense censer, rosary beads and poisoned communion wafers, a particularly transgressive idea due to the concept of transubstantiation. He’s literally killing people with the “body of Christ”. Hilarious. Anthony Sharp is wonderful here, old and seemingly frail, but in actuality far from it, driven by lust and sheer malice, he gives him an aura that feels sickly, like he poisons the air around him just by being there. It’s an absolutely horrible character, brought to vivid, foul life by a great actor. The cast of non-psychopaths are first-rate too. Penhaligon is decent enough and does what she needs to do without being spectacular, but Stephanie Beacham exudes that magnetism she usually brings, while Norman Eshley is a strong and likeable male lead and a far cry from his priggish Jeffrey character in George And Mildred. What really makes House Of Mortal Sin linger in the mind is that it ends so, so brilliantly. Everything comes to a head in an explosion of violence and discovery, but Walker twists your expectation over and over again, meaning when the curtain finally falls, you’re left there with your jaw open and possibly a smile on your face of your humour is of a gallows nature. Mine certainly is, anyway. House Of Mortal Sin isn’t Pete Walker’s finest moment, that’s Frightmare all day long, but with its wicked humour, imaginative set-pieces and not one but two wonderful villains, it certainly comes close.